By default, my first choice for the best odor eliminator is a good scrub, but sometimes you need a little more “oomph”. Many commercial air fresheners/odor removers are as bad or worse than the smell you're trying to get rid of. They contain toxic ingredients that can make you and your pets sick. We rented a cabin up north a few years ago, and the owners had placed a standing air freshener in the kitchen of the cabin. I had to move it outside because it gave me a headache. Another time, we were having a family gathering in the common room at my in-laws apartment building. Again, I started getting a headache, and my mother-in-law was having trouble breathing. The culprit? A plugin air freshener. In this post, we'll talk about the problems with most odor eliminators and “air fresheners”. Instead of turning to heavy fragrances to cover the odor, we can work to eliminate it. The Environmental Working Group tested 285 air fresheners. Of those 285, 213 (75%) rated a D or F for safety. 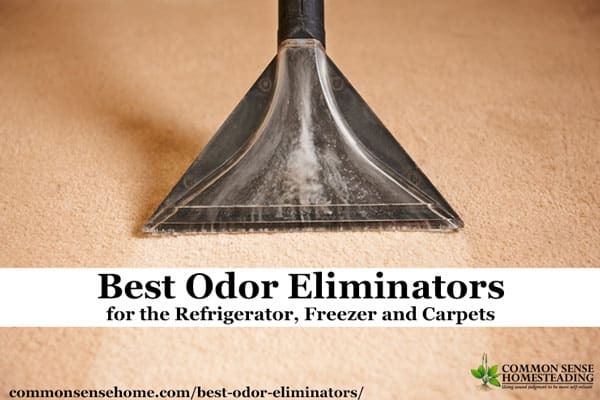 These poorly rated odor eliminators included popular brands such as Airwick, Febreze, and Glade, and even “green” brands such as Babyganics and Mia Rose Air Therapy. (Even Poo-Pourri toilet spray made the naughty list.) The top scoring factors: “May contain ingredients with potential for developmental/endocrine/reproductive effects; acute aquatic toxicity; nervous system effect” – pretty serious stuff. According to a study conducted by the Natural Resources Defence Council (NRDC), 86% of air fresheners tested contained phthalates. Phthalates, which are also found in many plastics, aerosol sprays, paints, pesticides, cosmetics, and fragrances, are notoriously disruptive to the body. As the NRDC reported in their research, “Most phthalates are well known to interfere with production of the male hormone testosterone, and have been associated with reproductive abnormalities”. Phthalates are on the State of California’s list of toxic substances “known to cause birth defects or reproductive harm”. The NRDC also warns that airborne phthalates can cause allergic symptoms and asthma. Even trace amounts of phthalates can accumulate to cause these harmful side-effects. In fact, a 2013 study of more than 2,000 pregnant women (reported in the International Journal of Public Health) found that women who used plug-in air fresheners during gestation were statistically far more likely to have babies that suffered from serious lung infections. personal care products (soaps, hand sanitizers, lotions, deodorants, shampoos, and baby products). These 25 products emitted 133 different volatile organic compounds (VOCs), for a collective total of 421 VOCs, and an average of 17 VOCs per product. Nearly one-fourth of these VOCs are classified as toxic or hazardous under federal laws. Each product emitted at least one of these chemicals. Some of these VOCs are classified as probable carcinogens with no safe exposure level, according to the U.S. Environmental Protection Agency. Virtually none of the VOCs emitted from the products were listed on any product label or material safety data sheet. 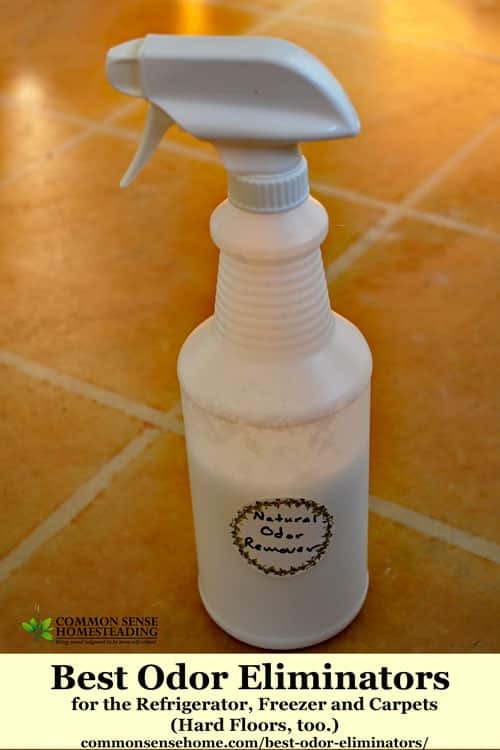 About half of the products made some claim of “green” or a related term, such as “organic,” “natural,” “essential oils,” or “non-toxic.” But the “green product” emissions of toxic or hazardous chemicals were not significantly different from the other products. Remember, it's normal for pets to lick their paws. If you're spraying an odor remover on the carpet, and your pet walks on it, they'll likely be licking VOCs. 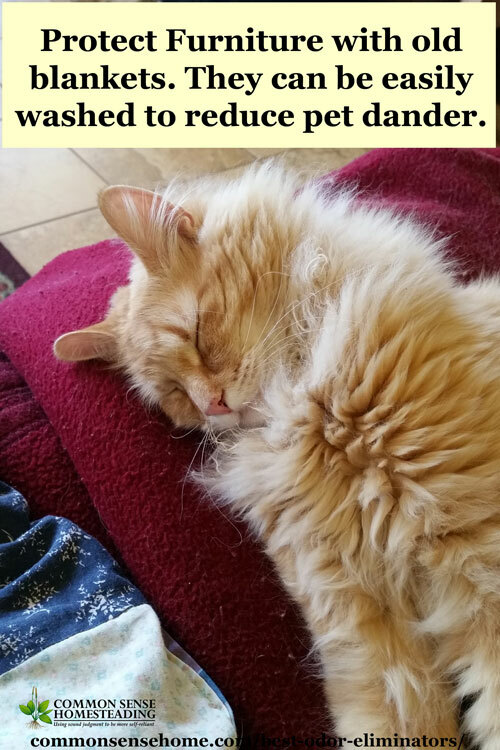 PetMD suggests keeping your pets out of any treated area. “Natural” doesn't necessarily mean safer, either. “Essential oils, which are included in many air freshener products, can be very toxic, especially to cats,” notes veterinarian Dr. Jennifer Coates. Rinse cleaners thoroughly, air out areas well, and wait at least 24 hours to let pets into a treated area. If you can smell fragrance, they can smell it, and may ingest it. We throw old blankets over any furniture that the cats are allowed on, and wash them regularly to keep down pet odors. Your odor eliminator options depend on where your odor is and what materials are involved. For stinky laundry, check out “6 Ways to Get the Musty Smell Out of Clothes and Towels“. For other surfaces, cleaning, fresh air and sunshine are my first line of attack. If you're dealing with something that can't be easily moved or stubborn odors, it's time for odor focused surface treatment. Apply mix to interior of refrigerator/freezer with a soft, damp cloth. Let sit a few minutes. Wipe clean and rinse well to remove any baking soda residue. Dry completely before turning back on and replacing food in the fridge. Note: For grimy gaskets, skip the essential oils, as they may break down the rubber. Scrub gaskets with an old toothbrush or small cleaning brush. Vanilla extract (imitation is fine) – Place about a quarter cup of extract in an open container on a lower shelf for a few days. You can also use the vanilla bean pods leftover from making homemade vanilla extract. Coffee grounds – For the coffee lovers – place a bowl with about half a cup of coffee grounds (unused) in the fridge. Add a few drops of essential oils or ground herbs such as cinnamon or cloves, if desired. Fresh herbs – If you have fresh herbs such as mint or lemon balm in your garden, clip a small bundle and keep it in your fridge. You can use one of those press on clips to hang it up out of the way, or simply leave it on a shelf. Discard when aroma fades. See also: “Spring Cleaning – 6 Steps to a Clean and Organized Kitchen” and “Freezer Meals Plus Organizing and Cleaning Your Freezer“. Carpets and rug can trap and hold odors. Carpet can also hide the growth of mold spores on the subfloor in damp conditions. Regular cleaning (and/or switching to hard floors) is recommended not only for odor control but also for indoor air quality. Vacuum regularly with plenty of suction and a high quality vacuum filter, combined with periodic extraction cleaning. For pet odors, stinky feet and other musty carpet odors, try this carpet deodorizer mix. Combine dry ingredients in a non-reactive bowl. Add essential oils and mix well, stirring to break up any clumps. Sprinkle mixture over carpet and wait several hours or overnight. Vacuum thoroughly. The odor remover granules remind me of the product that our school janitor used to use on vomit. However, unlike the janitor's vomit odor absorber, these granules don't stink worse than the vomit. (I still vividly remember the fragrance of those granules from all the way back in kindergarten, when the kid in the desk next to me threw up lunch – with peas. Ewwwwww!) 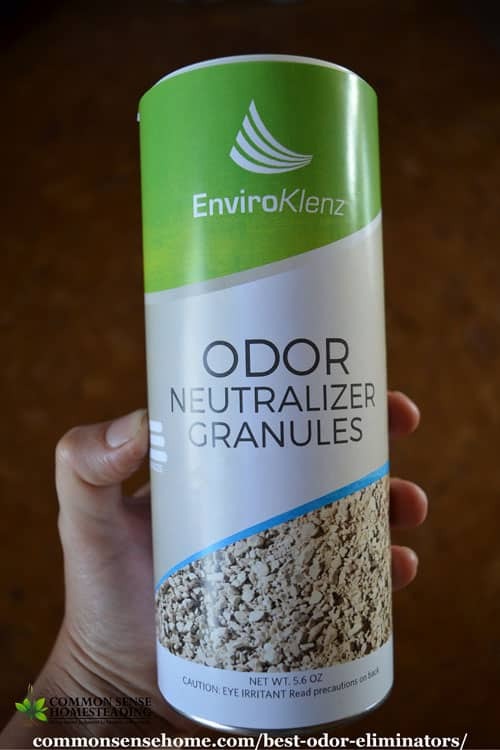 The EK Odor Neutralizer Granules smell faintly like chalk, with almost no odor at all. 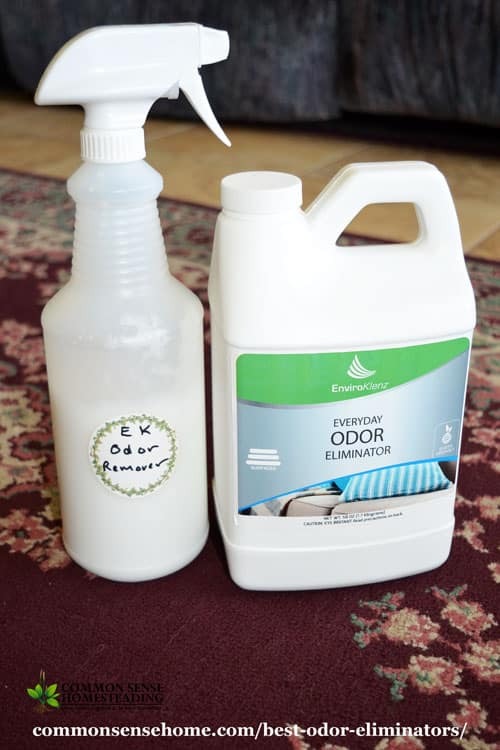 EnviroKlenz Everyday Odor Eliminator should be used in combination water extraction, such as a wet vacuum or carpet shampooer. If can also be used on hard surfaces. For normal use, mix one part Odor Eliminator with four parts warm tap water. For instance, 1/2 cup cleaner and 2 cups water. Place in a spray bottle and shake well to combine. Spray a light layer of product on the surface (spot test for darker colors). Allow to set for 15 minutes and then remove with a wet extractor or wash off. This also works on hard floor odors. Last week we had an unfortunate incident in the basement. A tomato went bad in the bottom of the harvest bin, and before I spotted it, it oozed into a foaming, smelly mess on the floor. Even after washing the floor, I could still smell rotten tomato. I mixed up a small batch of Everyday Odor Eliminator and spritzed the area. 15 minutes later I wiped it clean and the smell was gone. If you'd like to learn more about EnviroKlenz, you can watch the presentation below. The presenter's not very zippy, but he explains how the products work. I received three product samples to try out (one for laundry, the everyday odor remover, and the odor remover granules). I found them to meet or exceed expectations, so I'm featuring them on the site. I've also joined their affiliate program, so if you purchase through the links on my site, I receive an affiliate payment at no extra cost to you. Thank you! If you'd like to give the product(s) a try, click on the image below or visit “EnviroKlenz Everyday Odor Eliminator” or “EnvironKlenz Odor Neutralizer Granules“. Use code “CSH20” at checkout to get a 20% discount on your order.